There are usually two different schools of thought – In the short term, do you need to invest in “cash flow positive” property so you are able to hold it cost neutral (or perhaps even to provide some passive income) or are you able to take a longer term view where you are able to focus on targeting stronger capital growth? That is why time is so important in investment. Generally, the longer you are willing to wait for a return, the better the potential return may be. Unfortunately, not everyone has the luxury of time, which is why we always encourage people to start thinking about property investment early – just imagine if you had bought a property 10 years ago! For people that are already in retirement and require a steady cashflow, it may be more important to invest their money in property or development projects that provide a return straight away. 2. Can I afford to invest? If I borrow to capacity, can I manage my cash flow? If not, what is realistically affordable for me to invest? It is always wise to purchase property in the price range you can afford based on the deposit you have and the repayments you can comfortably make, rather than borrowing to the limit of what the bank will lend you. OYOB is exploring the creation of some financial calculators with additional features to help our clients work out the effects of extra repayments and/or property investment to “speed up home ownership”. 3. Should I buy an established house, or something brand new? The answer to this question depends entirely upon your goals. Generally, if you are looking for immediate cash flow, a positive or neutrally geared property is the way to go, and this limits you options to established property. If you have the luxury of time on your side, there are a myriad of great investment options in new suburbs and high growth areas that will give you better returns over the long term and can eventually provide a good income too. Many estates in Melbourne’s West, North and South-Eastern suburbs are selling so well that ballots are often now required. If you have a medium to longer term timeframe, OYOB’s Greenfield estates such as Mernda on the Park have helped our investors make serious returns at an affordable price. 4. Where should I look to buy? There are many variables on where the best suburbs are to buy, from suburb growth, to rental yields, to infrastructure and amenities… and this tends to require some research. Property sites these days such as realestate.com have good data on which suburbs are growing and help by comparing parameters such as long term growth vs incoming cash flow. One particular site we’ve discovered recently is microburbs. It isn’t just useful for property investors, but homebuyers too as it provides lots of information that every purchaser needs to know on schools, amenity and even internet access in the area! 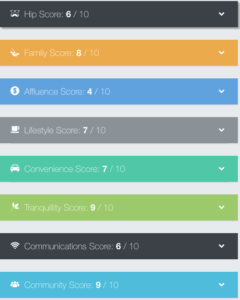 Compare locations and their ratings today. 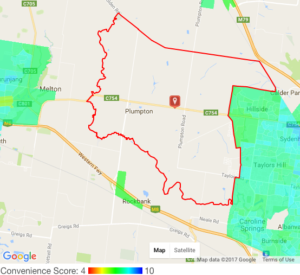 Screenshot of Microburbs report for Plumpton, VIC, home of OYOB’s Caroline Waters and River’s Run estates. Precinct Structure Plan to be released mid-2017. For OYOB, when looking into new growth areas a good indicator is government investment in local planned infrastructure such as train stations, schools, shopping centres and other amenities. This indicates planned or identified growth in the area and can positively impact the future sales price of the property. While a bit harder to obtain, with a bit of research you often can find this information from local council websites and government transport organisations. 5. Do I have the support I need? People often make simple mistakes when starting in property investment, or are in some cases even too afraid to start – this can be avoided if you have invested and developed through a number of property cycles, like we have. We’ve found that understanding your property investment options can often be the difference between being able to pay off your property in 25 years or less than 10. This is why we set up OYOB, to help educate investors to navigate property investment properly so that they can invest with confidence. Good luck and stay the course on your investment journey! Find out how wholesale property investment can help you achieve your property investment goals. Previous post: Do you want greater investment returns? Next post: What do the July 1 Victorian Government housing initiatives mean for me?